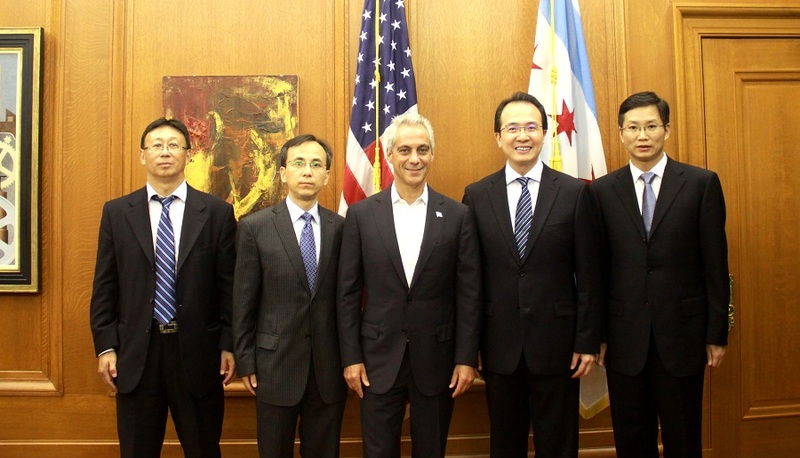 On August 1, 2016, Consul General Hong Lei paid a courtesy call on Rahm Emanuel, Mayor of the City of Chicago, at the City Hall of Chicago. Consul General Hong Lei said that exchanges and cooperation between China and Chicago has been expanding constantly in recent years. Mayor Emanuel attaches great importance to Chicago-China relationship and hosted Chinese Vice Premiers Liu Yandong and Wang yang respectively. Mayor Emanuel visited China annually in the past three years, which is unusual among mayors of American major cities. Bilateral practical cooperation has been broadening steadily. China has become the largest trade partner of Chicago Tariff Zone. Chinese investment in Chicago has created a lot of jobs here. In particular, in the first half of 2016, China's CRRC Corporation won a bid to provide railway cars for CTA, which marked new progress in the economic and trade cooperation between Chicago and China. People-to-people exchanges are robust with many highlights. For example, city-wide Happy Chinese New Year celebrations, China's First Emperor and His Terracotta Warriors Exhibition at the Field Museum, etc., have attracted hundreds of thousands tourists. China highly values the great efforts by the city of Chicago, Mayor Emanuel in particular, in enhancing Chicago-China exchanges and cooperation. According to Consul General Hong Lei, in the next five years, China will invest 100 to 200 billion dollars in the United States. Last year, there are more than 5 million Chinese and Americans traveling across the Pacific. As the third largest city in the US and economic and cultural powerhouse in the Midwest, there will be great opportunities for Chicago to engage in practical cooperation and people-to-people exchanges with China. The Chinese Consulate General would like to work together with the Chicago Municipal Government to broaden and deepen bilateral cooperation in areas such as trade, investment, culture, tourism,education,etc. Mayor Emanuel said that Chicago-China cooperation is in the interest of both. City of Chicago has signed a Gateway agreement with eight Chinese cities that focuses on trade and investment. Chicago, glad to see more Chinese companies coming here for development, would like to become the gate for their heading to the US and its Midwest in particular. With many first-class universities and research institutes located here, Chicago welcomes more Chinese students come to study and do research. Chicago also wants to invest more in Chinese language learning for middle and primary school students, making it a model in the US in this regard. Meanwhile, Chicago always welcome Chinese tourists. Deputy Consul Generals Liu Jun and Yu Peng, Deputy Mayor of Chicago Steve Koch were present at the meeting.